What does a book lover love besides reading books? Talking about books. One of the reasons Girl Who Reads got started was because I love talking about books and reading related topics with other book enthusiasts. 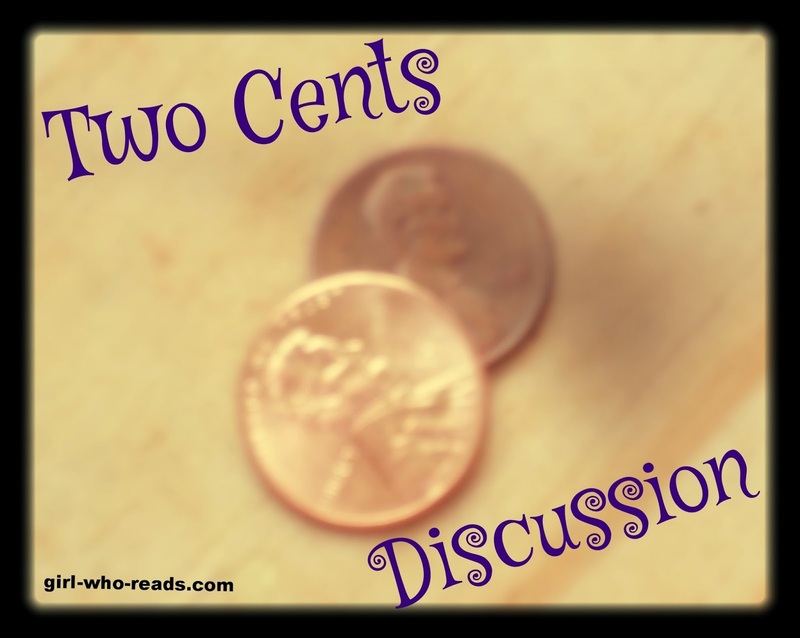 To allow us to talk a bit more about books, each week at Girl Who Reads there will be a discussion topic and everyone is welcomed to throw in their "two cents". You can do that by leaving a comment or if you are also a blogger and think your readers would want to get in on the discussion, you can post your response on your blog and link to it. Each Sunday, a new topic will be introduced and then we can spend the week talking about it. For bloggers that like to schedule their posts ahead of time the following week's topic will be at the bottom of the post. And for the bloggers that fly a little more by the seat of their pants, the linky will be open all week so you can join in any time. As the feature title indicates, I don't expect your "two cents" to be an in depth analysis (not that there is anything wrong if you want to do that). Instead, I hope you will participate in the discussions that occur here, on Facebook, Twitter, Google+, your own blog, etc. I want this to be fun and maybe get you thinking a little bit, but above all I want this to be a time for the community to engage with one another. I'll be hopping on this bus on Sunday too. I glad you all are interested in this new feature. I really hope to get a lot of good discussion going and getting readers, bloggers, and authors interacting with one another.